The high point of Gornergrat (3,089M) reached by the Gornergrat rack and pinion railway is a must-see destination for any visitor to Zermatt. 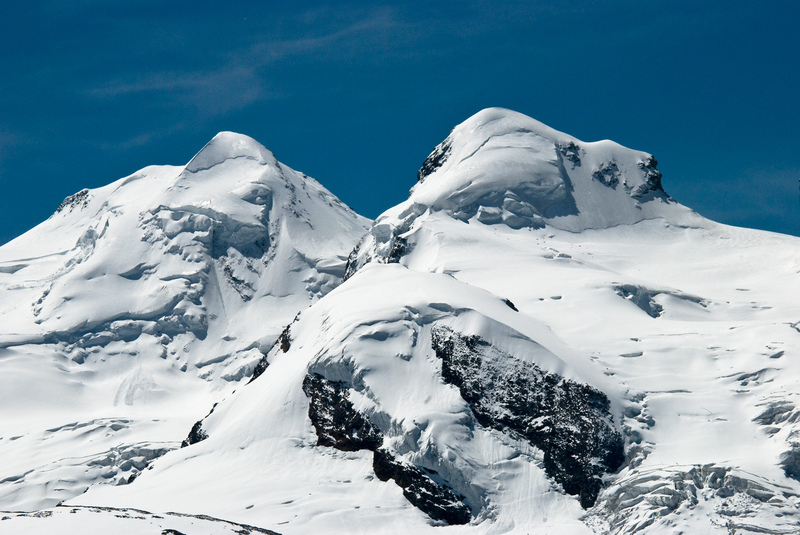 The panoramic view is one of the finest in the Alps including 29 summits over 4,000M. The railway (opened in 1898) climbs 1,500M from Zermatt in a little over half an hour. At the summit is the Kulm Hotel where visitors can stay overnight and hopefully experience an Alpine dawn. 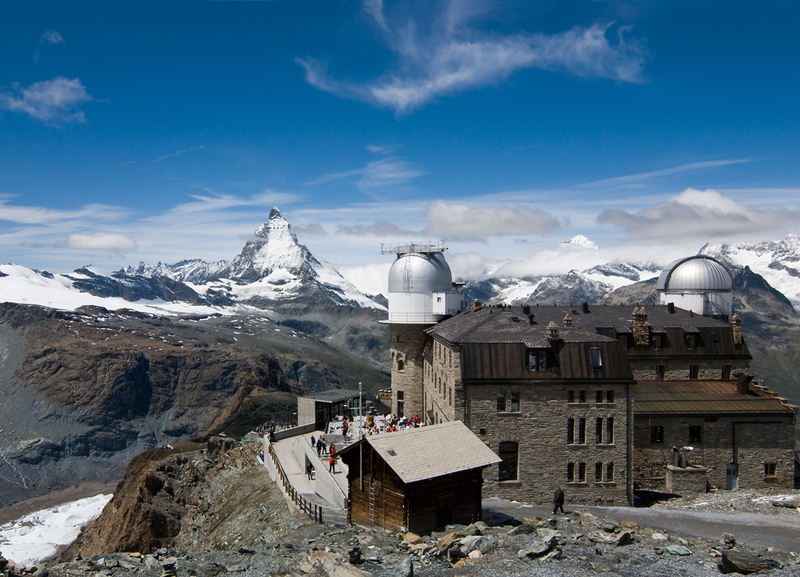 In addition there is a restaurant, inevitable souvenir shops, and the Gornergrat Observatory. Please do enlarge the images in this post – they will benefit from it. No post from Zermatt would be complete without a view of the Matterhorn as seen past the Gornergrat buildings. From wherever this mountain is viewed it stands in splendid isolation emphasising its elegant silhouette. Last week I posted images of The Gorner Glacier – the second largest glacier in the Alps – a bleak landscape when seen in isolation. Today it’s time to raise our eyes and see what lies above it. 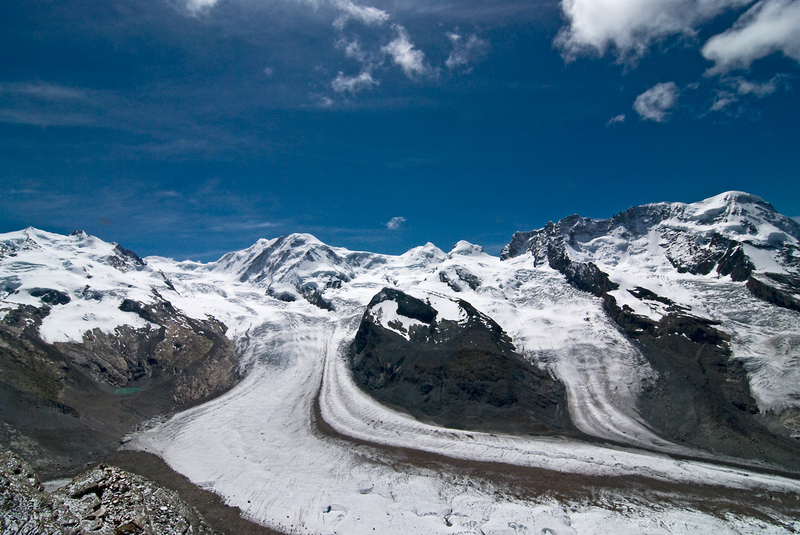 The Gorner Glacier lies on the South side of Gornergrat and the view that greets the visitor in that direction is a spectacular sweep of snow-capped mountains. To encompass this view you need a wide-angle lens. This image was taken at 16mm (film equiv) and that only just squeezes this extraordinary vista into the frame. 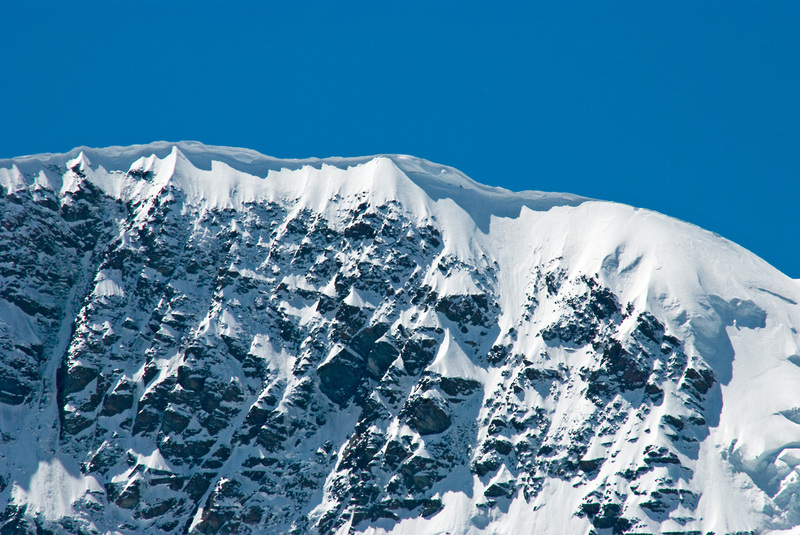 This is the Frontier Ridge: the Swiss-Italian border traces its line along the ridge line. Photography in the mountains can never truly convey scale, mountains are diminished in an artificial way through a lens – they truly have to be seen to be believed. To give you some idea of scale this image stretches 6 miles edge to edge as the crow flies; but that also undervalues an arc of mountains that is over 10 miles long. 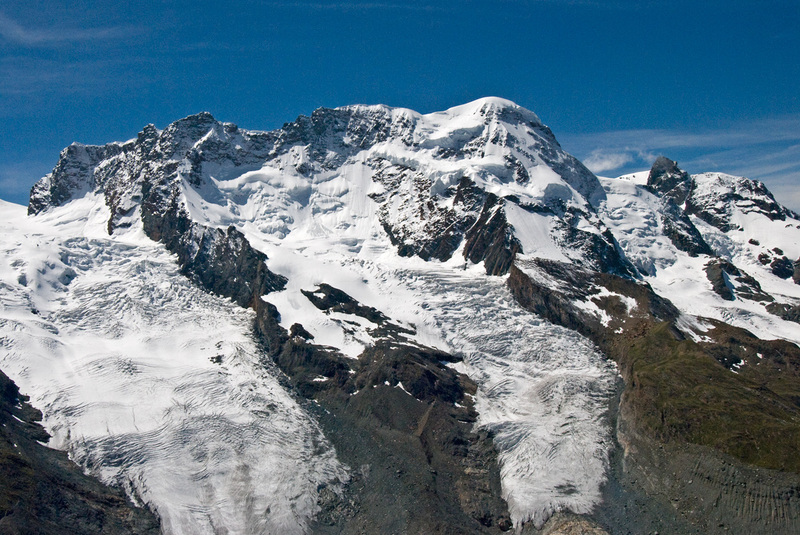 It stretches from Monte Rosa on the left, through Liskamm, Castor and Pollux, to the mighty Breithorn ridge. Each peak deserves individual study. 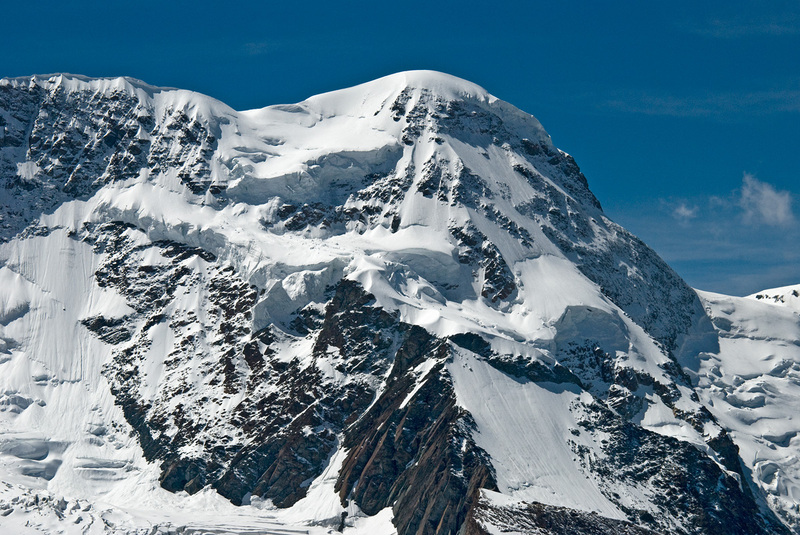 The highest point of Monte Rosa is the Dufourspitze – the highest summit in Switzerland, but not its highest mountain. 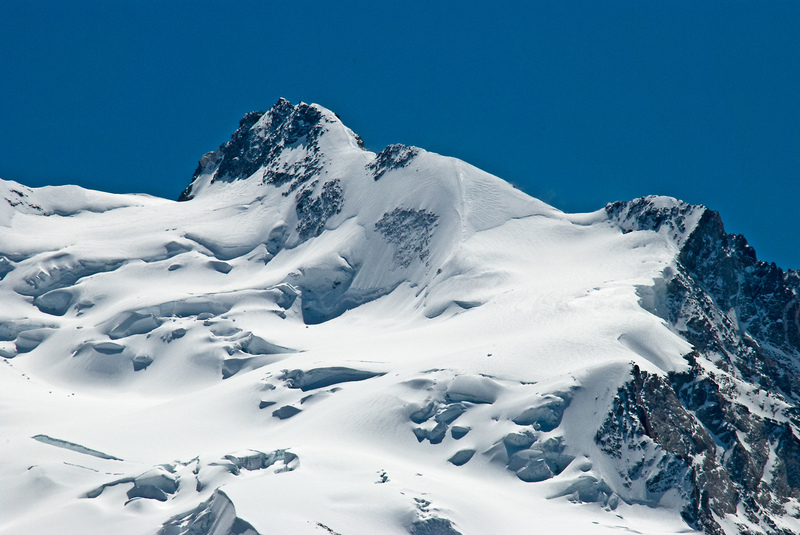 To resolve that apparent contradiction do read my post: ‘Switzerland’s Highest Mountain’. The route to the summit winds its way up the vast snowfields to the dip in the ridge on the Rt skyline which it then follows to the final rocky ridge ending in the summit. Move right from this lofty summit over the Grenz Glacier and the next mountain you see is Liskamm. A Five Kilometre ridge (3.25miles) from end to end. Its size, relative isolation, and its notoriously double-corniced ridge make this mountain a serious undertaking. 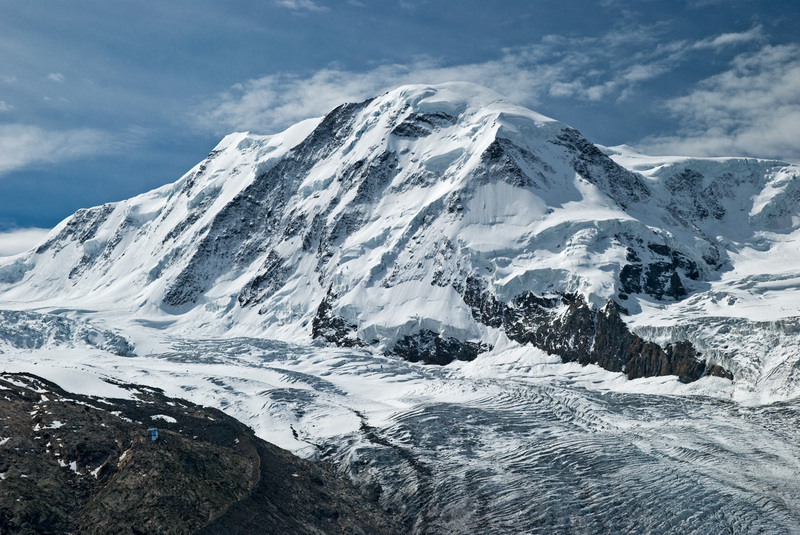 This image is not actually taken from Gornergrat but about 1,500ft vertically below it on the trail to the Monte Rosa Hut (click here to view my post on that walk). From this viewpoint you get a better impression of this vast mountain and also it allows the inclusion of the Monte Rosa Hut sitting on the rocks lower left corner (seen here as a bizarre silvery-blue diamond). Next up are the twin peaks of Castor and Pollux – together they provide a delightful silhouette. Substantial 4,000M peaks in their own right, they are dwarfed by their neighbours. And finally we come to the Breithorn. Each mountain in this panorama has its own character. Here we have another substantial mountain. 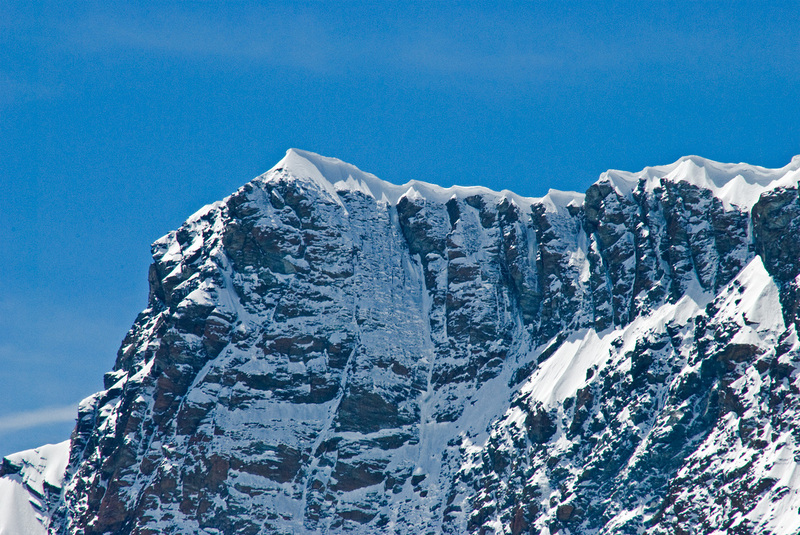 The ridge itself is 2.5 Kilometres long with three summits: From the Left they are: Roccia Nera, Central Summit, West Summit. This is a mountain that offers something for everyone. The West Summit is probably the easiest summit in the Alps approached from the Klein Matterhorn lift (if you enlarge the image you should be able to see the lift housing projecting from the right edge of the small triangular rocky peak on the right of the image). The traverse from the Central to West Summit is a dramatic knife-edge snow crest corniced in places which is a delight for those with a clear head and no fear of heights. The complete traverse is still on my list of climbs to complete – a more substantial undertaking. The following three images view sections of this wonderful mountain – the cornicing on the ridge is clearly visible. 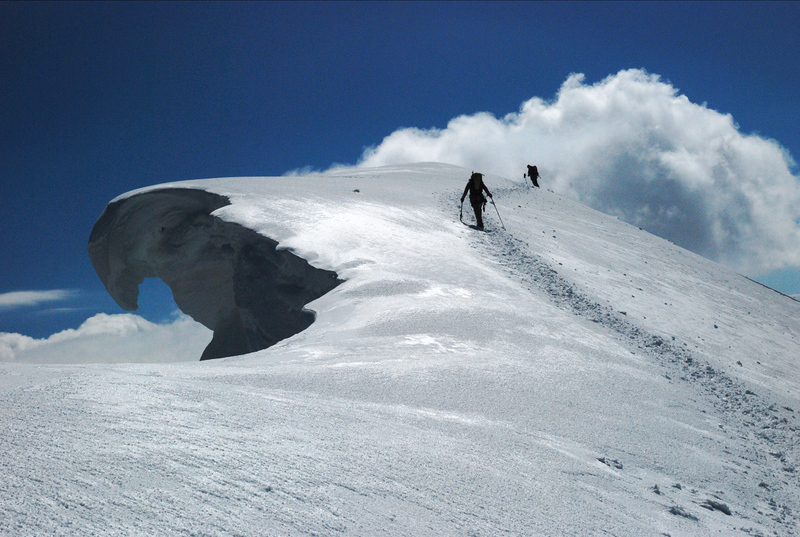 And finally to give some idea of a cornice close up – here is one on the final stretch to the Central Summit. Climbers stay well clear of the potential fracture line. This is a mighty panorama, but remember we are only looking South. This is just part of the view. This entry was posted in Climb and Trek, MountainScape and tagged Breithorn, Castor, Dufourspitze, Gorner Glacier, Gornergrat, Grenz Glacier, Liskamm, Monte Rosa, New Monte Rosa Hut, Photography, Pollux, Valais Alps, Zermatt. Bookmark the permalink. Wonderful images Andy – makes me want to book a flight right now! Absolutely stunning shots, Len. Wow. Amazing scenery. Wonderful images Andy. What a view in that first one. Quite awesome. Although I won’t get there, I am looking forward to seeing Switzerland for the first time. Taking a river cruise there from Amsterdam. Thanks Len. The wide shots give some idea of the panorama but nothing can compare with the real thing. Not sure when you’re off on your cruise through Europe but have a great time. I’m ready to reserve my room at Kulm Hotel (that is if I can afford to go). This looks like the vacation of a lifetime, especially for photographers. Thanks Ken. Switzerland can be expensive, and has a reputation for being so, but it is perfectly possible to stay in budget hotels, or even hire apartments at a reasonable cost. We have often done that – and everything is spotlessly clean. I wish I had been born Swiss! Wonderful images and a nice geography lesson as well. Thanks for sharing. Thank you Steven – it’s a pleasure. Wow fantastic images Andy. You’re right they look incredible enlarged. Thanks Edith. It does pay to enlarge them doesn’t it. My pleasure, Pawel. Thanks for the comment. Geez, Andy, I’ve got goosebumps trying to get my head around the scale of this place! GREAT GREAT photography, my friend! Thanks so much Toad. Photography is not good at capturing Scale in the mountains. Lenses play tricks with your eyes. Believe me the scale is Majestic. Thanks for your comments. Oh man, absolutely fantastic stuff. So majestic and beautiful! Sorry I’ve been absent for a while, moving across the world is quite an endeavor!! I’ve gotta catch up on your work! Hi Adam and thanks for commenting. I knew you had moved back across to the States – I guess that was quite an upheaval and a disruption. Love the Frontier Ridge! Great shot!